Let me start by this disclaimer: Under no circumstance do I assume that Australia (or most nations for that matter) can ever match the US when it comes to investing in new ventures. However, the US provides a glowing example of how things can be done, so one would hope learnings can be transferred elsewhere. However, there have been a lot of articles lately in Australian press highlighting some of the problems facing entrepreneurship in Australia when it comes to raising capital. I have certainly heard claims that improvements are happening – often referring to how companies like Pollenizer and Blue Chili lead the way to help entrepreneurs get to the next stage by providing them with critical services to grow. However, the capital sector is far lagging and one has to wonder how this up-hill battle will pan out. 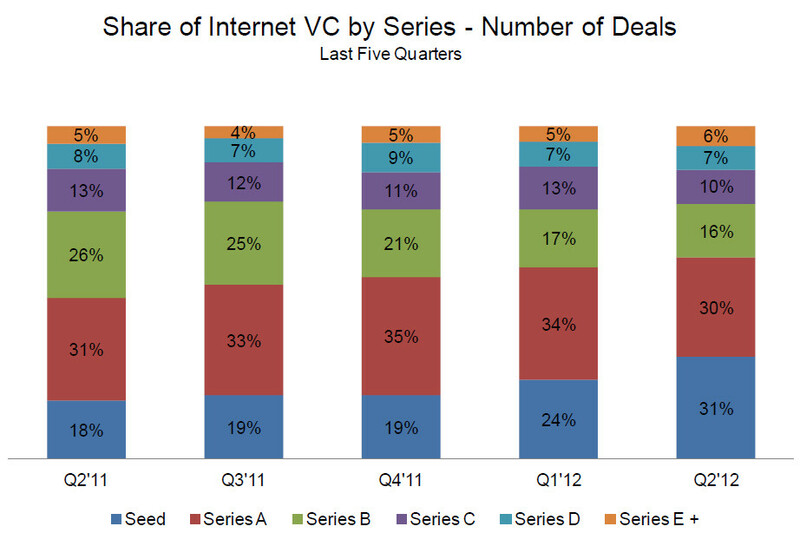 This shows that in the US, the largest amount of deals are focused on the seed stage (The chart shows the internet sector. For all sectors, seed represented 22%). Contrasting this with the Australian number, it is clear that Aussie investors prefer not to invest in ideas and people, rather prefer to wait until revenues and products are proven, thereby taking less risk. What is the problem with this? Seed companies are the start of the funnel. In order to have enough quality deals in later stage, you need a healthy pipeline of seed companies – and availability of capital is the key to make this happen. Is there hope? Well, there are organizations starting to attack this from the ground up, especially in terms of breeding better entrepreneurs. There are also some glimmer of hope with new funds being raised and new professional VCs being established. Whether that will help change the investor environment’s attitude towards risk remains to be seen – but hey, you have to start somewhere. Tagged with Blue Chili, CB Insight, Pollenizer, seed stage investment, Venture Capital. Good article JT. The seed sector is certainly picking up here in Australia in the last year and there are a some great startups that are getting some of the action. But the next phase, the $1m-$5m investment range, is almost non-existent here. Very interested to see if Blackbird Ventures can make some in-roads. Thanks David. It also depends on the definition of seed. While angels may be willing to put up $50-100k, US seed funding is significantly higher (ranging from around $1m up to $3m depending on the survey: http://www.ventureexaminer.com/venture-examiner/2011/8/1/seed-investment-sizes-rise-but-stay-in-check.html), putting US ventures at a much better advantage (besides the obvious ones of being where the money is). Secondly, although there is no data for Australia to support it, the valuation of companies in the US are significantly higher, with US seed companies often valued at around $4m: http://www.fenwick.com/publications/pages/seed-finance-survey-2011.aspx. I’d love to hear of any Aussie start-up achieving this type of pre-money valuation at the seed stage (I actually happen to think that is probably too high, but still, the scale is so way off to Australia it is not even funny).